The Medigraph (a.k.a. Pulsimeter), a high quality chronograph with 45 minute time recording capabilities and pulsations indices, was specially designed to provide the wearer with the ability to easily calculate a patient’s per-minute heart rate. 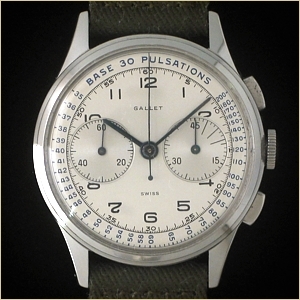 One of the most rare of Gallet's 20th century watches, the company's archives show that only a handful were produced initially for physicians and military medics during WWII. After the war, this model was available exclusively by special order until production was completely halted in 1952. 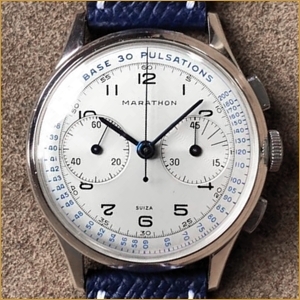 Since then, the Medigraph has become a coveted timepiece for both collectors and those in the medical fields, achieving very impressive results when examples occasionally appear at auction.